Last week, when Kavanaugh testified before the Senate Judiciary Committee about Christine Blasey Ford’s allegations that he had sexually assaulted her at a party, pinning her to a bed, attempting to undress her, groping her, and covering her mouth when she tried to scream for help, Graham exploded against Democrats on the committee and at his fellow Republicans who treated Blasey Ford’s accusations as credible. This surge elated right-wing media figures, who turned Graham into an overnight hero. The rapid flip was jostling, considering that those same media figures regularly lambaste Graham for his criticisms of Trump. But as Graham has warmed to Trump, so has the right-wing media warmed to Graham. Last week proved to be the catalyst for a full-on love affair. Ben Shapiro’s outlet, The Daily Wire, edited together montages of “Graham 2.0” and posted those videos to Twitter. Lindsey Graham 2.0 is pretty fantastic. Benny Johnson, a disgraced journalist now working at The Daily Caller, declared Graham was “BASED.” Johnson also employed the outdated “thug life” meme to celebrate Graham. I just took the most thug life @LindseyGrahamSC photos of the entire Kavanaugh saga. Kaya Jones, a former member of the musical group The Pussycat Dolls turned pro-Trump social media pundit, praised Graham. Conservative columnist Matt Walsh expressed a similar sentiment. Cassandra Fairbanks, a writer for the right-wing blog Gateway Pundit, had as much to say. Charlie Kirk, president of Turning Point USA, called Graham a “WARRIOR” for truth. I can’t get enough of this new version of Lindsey Graham! And there were countless more examples. Joseph A. Wulfsohn at the Federalist wrote that Graham “will forever be known as the man who helped pave the way to a conservative-controlled Supreme Court for an entire generation.” Breitbart has run more than a dozen favorable articles about Graham since his rant before the Senate Judiciary Committee. 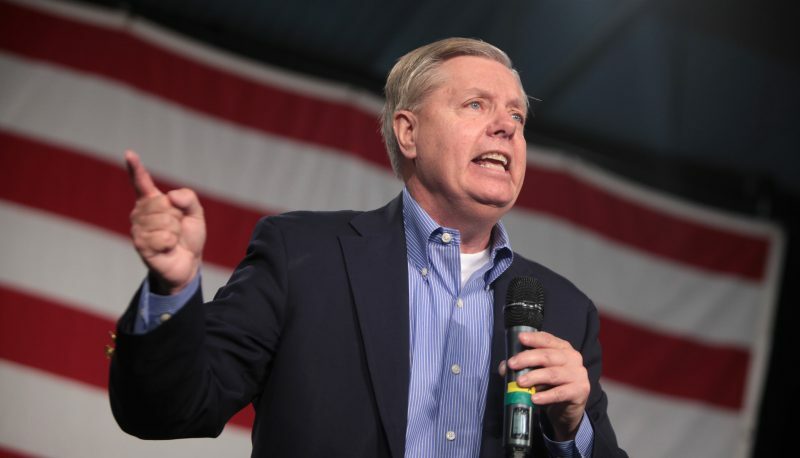 A column on WorldNetDaily states, “Lindsey Graham said something honest for a change,” and another questioned whether Graham was Trump’s “best GOP ally.” That admiration has continued throughout this week, as Graham continues to give contentious interviews with media and as he aggressively buckles himself to vote for Kavanaugh. The only thing that has noticeably changed between the Graham that conservatives once thought to be unreliable and the newly declared “Graham 2.0” is his vicious support for Kavanaugh. And for right-wing media, who have worked overtime to defend Kavanaugh and question the veracity of Blasey Ford’s testimony, that defense seemed to be all it took.